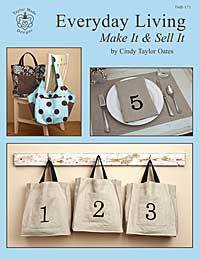 Pattern booklet by Cindy Taylor Oates has fast and easy projects that you can make as gifts or even sell! Patterns include a market bag, everyday tote bag, and a grocery bag holder as well as an apron specialized towels with yo-yo's, placemats, etc. Pattern pieces are included for the bags and also number stencils.